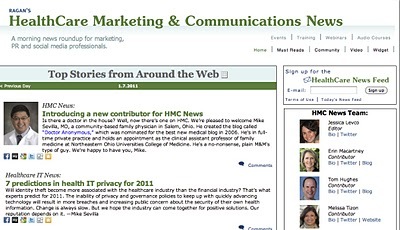 I'm happy to announce (in the video above) that I have been asked to be a contributor to the Healthcare Marketing and Communications Newsletter from Ragan Communications. Thanks to Jessica Levco, the Editor of the newsletter, for the invite. I met her when attending the 2010 Swedish Health Care Symposium. In the newsletter, I will be summarizing stories that I read in my own unique style. If you have never checked out the newsletter before, I strongly encourage you to check it out - especially if you are involved at all in the medicine, healthcare, social media, and marketing industry. I would also like to welcome those of you who have clicked on over from the newsletter to check out my blog. As you can see, I dabble in a lot of areas of social media including blogging, a live internet radio show, you tube video, twitter, facebook, linked-in, and other stuff. I also invite you to check out my interview from Medical Economics from December 2010. Thanks for stopping by!